The Fisher Price Go Baby Go! Bounce and Spin Zebra is not new this year, but still a best seller for kids age 12 months to 3 years old. This toy won awards in 2006 when it was introduced and still rates very highly among parents. 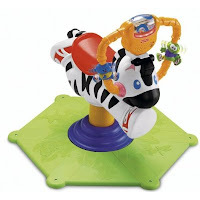 Your 1 year old baby or Toddler will be able to bounce and spin on the Zebra while it plays one of 5 fun songs. Kids can spin all the way around, a full 360 degrees! The lights, music, and spinning make this toy way more fun than the average ride on toys. This great toy averages 4.5 out of 5 stars based on hundreds of Amazon customer reviews.